FLICKA FLICKA FLICKA FLICKA! That’s the sound of the Northern Flicker! The Northern Flicker is a type of woodpecker, but it looks very different from most other woodpeckers. Northern Flickers are about the size of an American Robin and males have a red mark on their faces that almost looks like a mustache. Their white rump patch is another distinguishing field mark easily seen in flight. 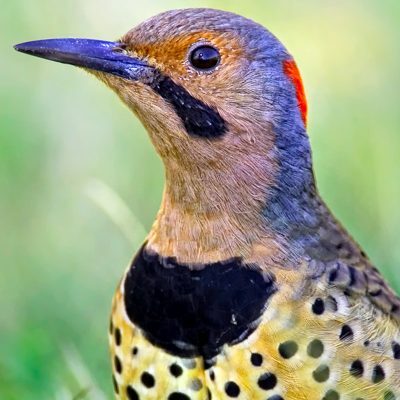 Like many other woodpeckers, Northern Flickers can be heard drumming or hammering wood in search of soft grubs and other insects. Unlike most other woodpeckers, flickers are frequently seen hopping around on the ground looking for their favorite food, ants and beetles.